As part of Larch Hill’s Environmental initiative, Larch Hill International Scout & Guide Centre has a range of Eco-Adventure Activities. These activities are self led and suitable for all ages from beaver scouts right up to scouters themselves. There are 13 Eco Adventure Activities and these are aimed to create awareness in many different environmental issues. 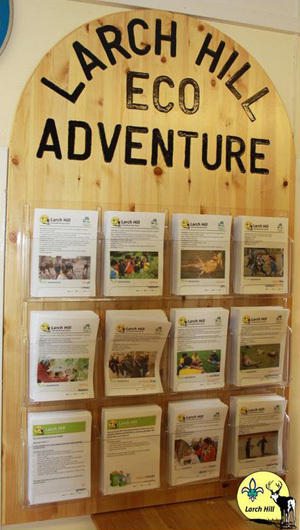 These activities are available from the Larch Hill Eco Adventure board located in the main campsite reception. The eco activities do not have to take place in Larch Hill; they are available to download HERE Why not incorporate some of these into your programme at your next scout meeting or activity or pop into campsite reception and our staff would be happy to suggest some activities for you and your group.